How to create a Lesson using the Drag and drop into Image Component? Using this component, you can create Drag and drop type of questions using both text and images as draggable alternatives. This type allows learners to drag a piece of text or an image and drop it on one or more corresponding drop zones. Drag and drop into Image questions can be used to test the learner's knowledge on a given topic as a variation to Multichoice questions. This type enables the learner to associate two or more elements and to make logical connections in a visual way. 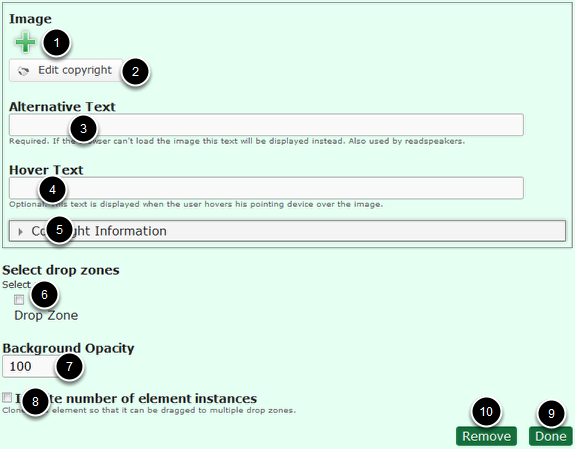 Description and instructions can be given in a text box. Drop zones and draggable text boxes or images are placed in their initial places. 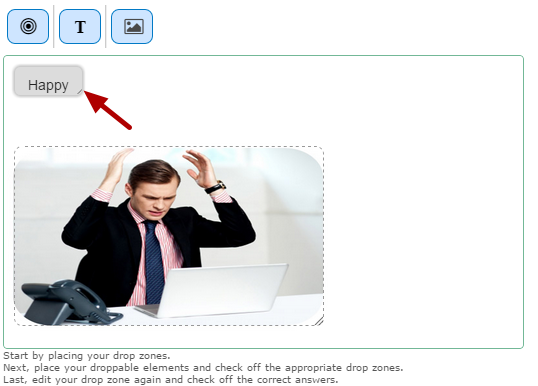 Drag the correct draggable textboxes or images and drop them into the predefined drop zone over the image. Click the Check button to check if the dragged answers are correct or not. If the user has dropped any correct answers, it will be highlighted in green. If the user has dropped any wrong answers, it will be highlighted in red. 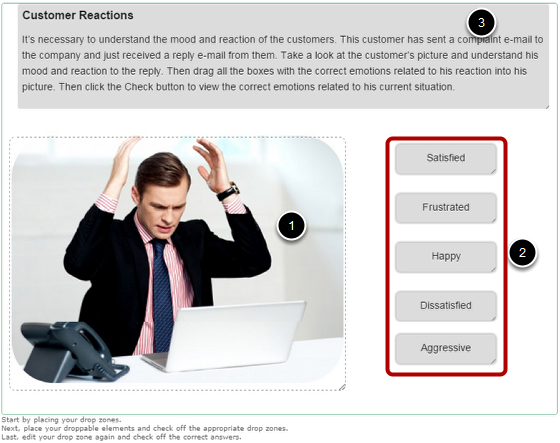 The user can drag back the wrong answer to their initial locations. You can make images as draggable items as well. You can set the background opacity for draggable texts or images individually. You can override the opacity for all the draggable items as well. Tip texts can be added to each item. You can create infinite number of element instances. You can create any number of drop zones and draggable items and associate them as per your needs. 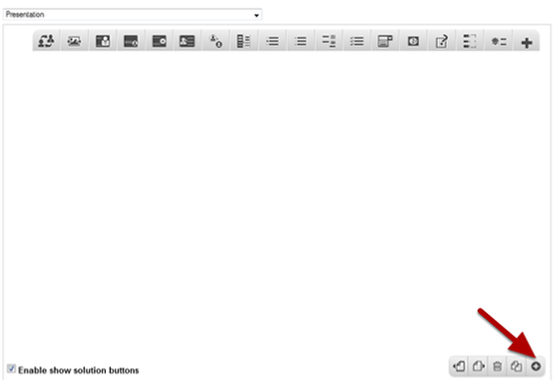 Then click on the Drag and Drop into image Component icon as shown in the above image. You can add a background image for the card using the ‘+’ icon below the Image  field and edit its copyright details by clicking the Edit copyright  button. Enable retry option by clicking on the Enable Retry button  checkbox. Disable to give one point for each draggable item that is placed correctly by checking the Give one point for the whole task  checkbox. Check Require user input before the solution can be viewed  checkbox to make sure that the user should drag something into the drop zone before he/she can view the solution. Type the opacity value in the Background opacity for draggables  text. You can add an optional image for the card by clicking the '+' icon under the Background image title as shown in the above image. You will choose an image file as shown in the below image. If you click the Enable Retry button checkbox, you can give more chances to the user to retry. This option is optional. By default, it is enabled. By default, the user will be given one point for each item that he/has placed correctly. You change it to give one point only to the whole task by checking the Give one point for the whole task checkbox. This option is optional as well. It is enabled by default. If you check the Require user input before the solution can be viewed checkbox, then the user must drop some element on the drop zone before clicking the check button to view the correct answer. This option is optional as well. 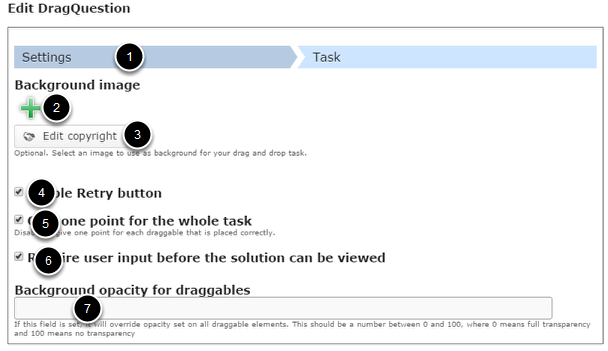 You will be prompted to set the background opacity for each draggable item in this component. However, you can override the background opacity for each draggable item by typing the background opacity in the Background opacity for draggables field shown above. This should be a number between 0 and 100, where 0 means full transparency and 100 means no transparency. 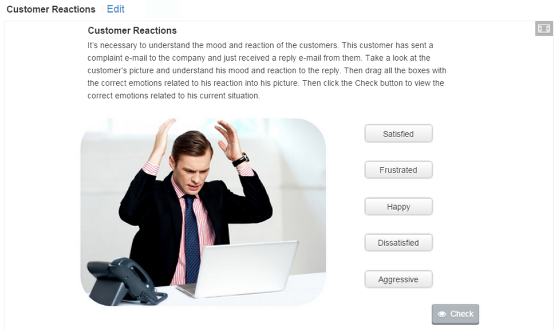 Add label or draggable text boxes with answers by clicking the Insert text  icon. Add draggable images by clicking the Insert image  icon. Organize the boxes in the Background Area  of the task. The background image will appear here. Then click on the Drop Zone icon shown above. Drop zones are the areas on which draggable text boxes and Images can be dropped. On this screen, type the label for the drop zone in the Label  field. You can also change the format of the text. This field is mandatory and must have some text in it. This label won't be shown to the user by default. 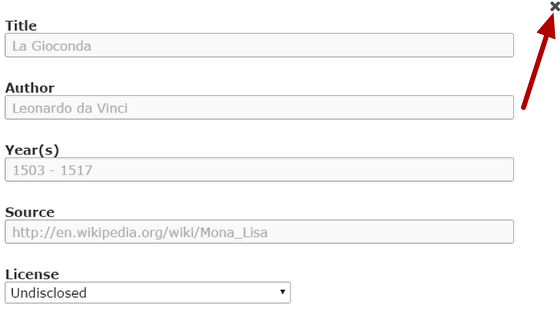 If you want it to be visible, check the Show label  checkbox. Type the background opacity value in the Background Opacity  field. The value must be between 0 and 100. This field is optional. We need to set it to 0 since we want the background visible. You can also add a tip to this drop zone by typing it in the Tip text  field under Tip title. You can make this drop zone to hold only one draggable item by checking the This drop zone can only contain one element  checkbox. Once you’ve checked this option, the user won’t be able to add more than one item into this drop zone. Once you’ve added all the changes, click the Done  button to save the changes. You can also remove or cancel this drop zone by clicking the Remove  button shown above. Once you click the Done button, you will see the below screen. You can see the drop zone you just created on the top left corner of the uploaded image. Move and resize the drop zone so that it is placed roughly over the background image. You move the drop zone by clicking and dragging it to where you want it be placed. You resize the drop zone by clicking the lower right corner of the drop zone and dragging up/down or left/right to scale the drop zone to the right proportions. Resize and drag and drop the drop zone over the specific area of the image. You should now have something like the above image. We are about to add some draggable text boxes with answers to the task. To do that, click the Insert text icon shown in the above image. You will see the below image. On this screen, type the label of the draggable text box in the Label  field. You can also change the format of the text. This field is mandatory and must have some text in it. Then select the drop zone for this box from the list of drop zones under Select drop zones  title, in our case, a drop zone named Drop Zone. Check this checkbox. Then set the background opacity for the draggable text box in the Background Opacity  field. We set it to 75 to make it semi transparent. You can clone this draggable checkbox, so that the cloned items can be dragged to multiple drop zones. 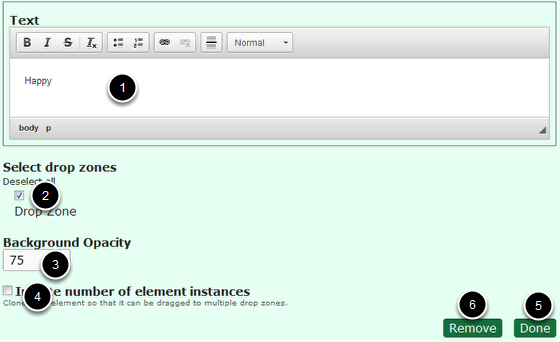 To do that, check the Infinite number of element instances  checkbox. We leave it unchecked for our task. Once you’ve added all the changes, click the Done  button to save the changes. You can also remove or cancel this drop zone by clicking the Remove  button shown above. Once you click the Done button, you will see the below screen. 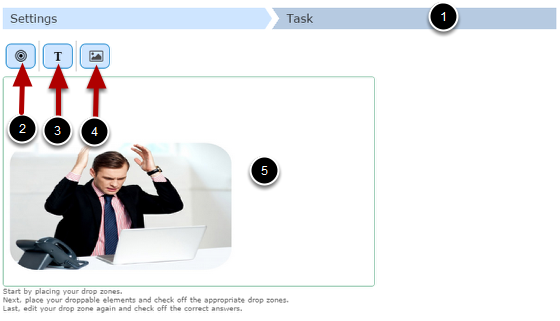 In the above image, you can see 5 draggable answer boxes being added to the task. 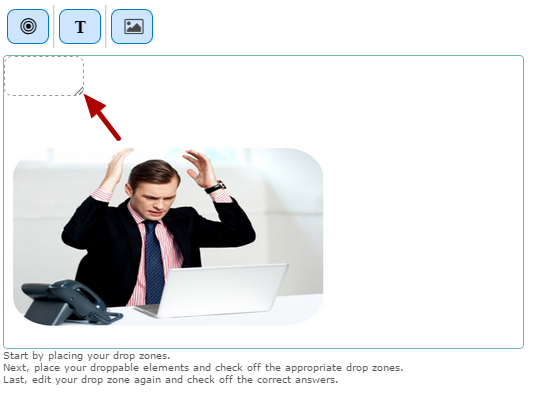 You can view the drop zone , draggable answer boxes  and some description text  as shown in the above image. Text description text above the drop zone and draggables won't be draggable. You can add such non-draggable text boxes just by leaving the drop zones unchecked under the Select drop zones title. 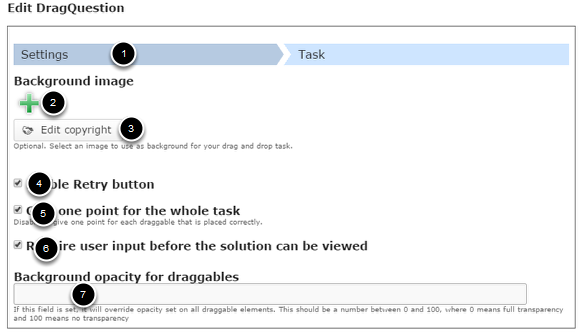 You can also add draggable images to your task. These images will work just like the draggable text boxes and you can drag them into the drop zones. To add a draggable image, click the Insert image icon shown in the above image. You will see the below image. You can add an draggable image by clicking the ‘+’ icon under the Image  title and edit its copyright details by clicking the Edit copyright  button shown above. You can also add some alternative text that will be displayed if the browser can't load the image in the Alternative Text  field. This field is also used by readspeakers. You can also add a hover text in the Hover Text  field, which will be displayed when the user hovers his pointing device over the image. You can add some more the copyright details of the image by clicking Copyright Information  field. 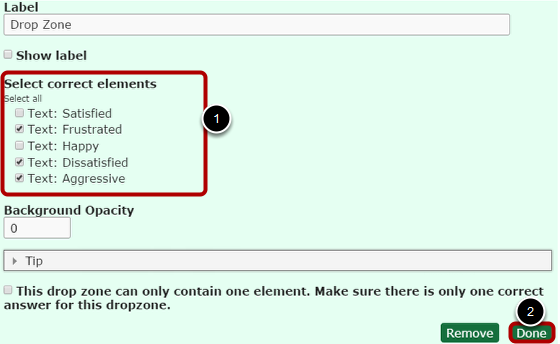 Once you’ve uploaded the required image, check the drop zone under the Select drop zones  title. You can also set the opacity of the uploaded image in the Background Opacity  field. This value should be between 0 and 100. 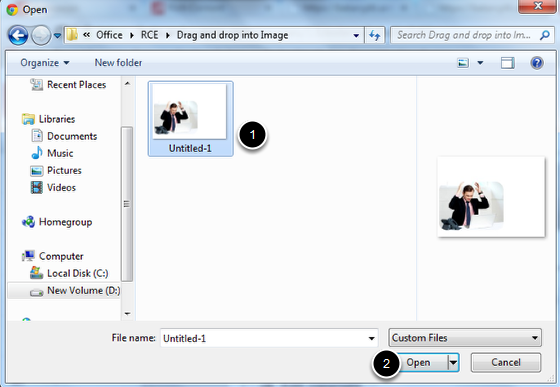 You can clone this draggable image, so that the cloned images can be dragged to multiple drop zones. To do that, check the Infinite number of element instances  checkbox. Once you’ve added all the changes, click the Done  button to save the changes. You can also remove or cancel this drop zone by clicking the Remove  button shown above. 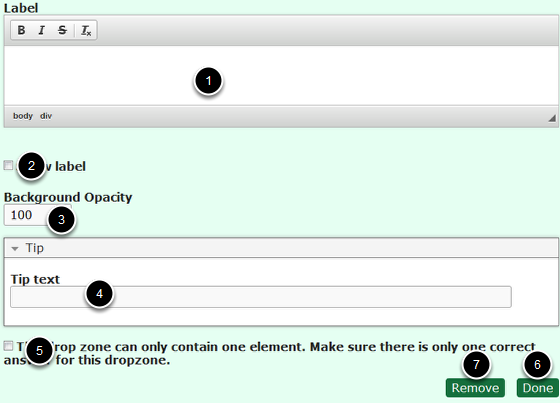 In order to define which draggable elements are correct, just double click on the drop zone. You will have something like in the above image. You will now see a Select correct elements  option. Check the checkboxes of the correct draggable items to define them as the correct answers. Then click the Done  button shown above. You can upload images only in .jpg, .gif and .png formats. You can create any number of drop zones and associate draggable items to them. Alternative Text for the images is mandatory. If you don’t want the drop zone hide the image behind, set the drop zone’s background opacity value to 0. The Drag and drop into Image question will be scaled to the maximum width of the page where it is placed, after clicking the Done button. The Size field defines the width and height of the editor as well as the aspect ratio of the Drag and drop question, rather than the actual size in pixels when it is viewed. So, set the task size equal to the dimensions of the background image. You can double click the drop zones and draggable items to edit them at any time.